This is a great light vegetarian dish in the summer and can be served with a side salad. Slice aubergine length ways and pan fry in hot olive oil until golden brown. Season accordingly. 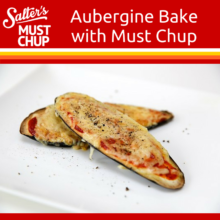 Remove from oven and spread a thin layer of Must Chup over aubergine and cover with Grated Cheddar cheese. Place back in oven and cook until cheese has melted.